Topps announces that it is including 20 top picks from the 2004 Amateur Baseball Draft into packs of 2004 Topps Traded & Rookies. In addition to the 20 Draft Picks, Topps will also include an all-new 1 of 1 parallel for the regular set and a 1 of 1 Blue Refractor Parallel for the Chrome set. And the ever-popular printing plates are also a new addition. There will be 1760 plates in all! Printing Plates - 4 Versions of Base Set and 4 Versions of Topps Chrome. 1760 TOTAL. 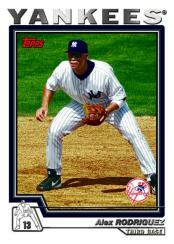 2004 Topps Traded & Rookies, which features 2 brands in one (Topps & Topps Chrome), releases October 18th. Each 10-card pack (8 Topps & 2 Topps Chrome) carries a $3.00 SRP. Each 24-pack box guarantees one Autographed or Relic card.